Explanation: It is one of the more massive galaxies known. 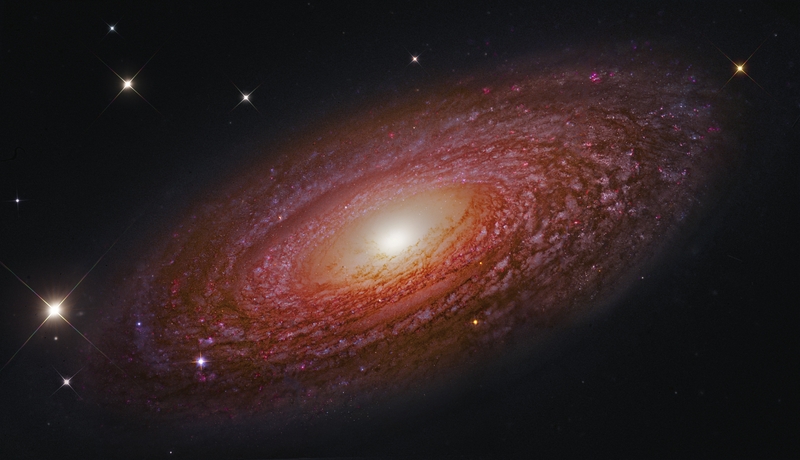 A mere 46 million light-years distant, spiral galaxy NGC 2841 can be found in the northern constellation of Ursa Major. This sharp view of the gorgeous island universe shows off a striking yellow nucleus and galactic disk. Dust lanes, small, pink star-forming regions, and young blue star clusters are embedded in the patchy, tightly wound spiral arms. In contrast, many other spirals exhibit grand, sweeping arms with large star-forming regions. NGC 2841 has a diameter of over 150,000 light-years, even larger than our own Milky Way and captured by this composite image merging exposures from the orbiting 2.4-metre Hubble Space Telescope and the ground-based 8.2-metre Subaru Telescope. X-ray images suggest that resulting winds and stellar explosions create plumes of hot gas extending into a halo around NGC 2841.